If you're scouting for a casual yet sharp getup, reach for an ATM Anthony Thomas Melillo cotton crewneck and green sweatpants. Both garments are totally comfortable and will look great together. 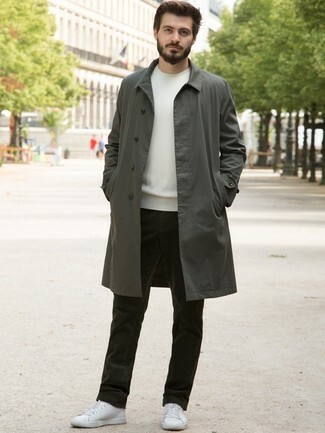 When it comes to footwear, this ensemble is complemented wonderfully with white low top sneakers. 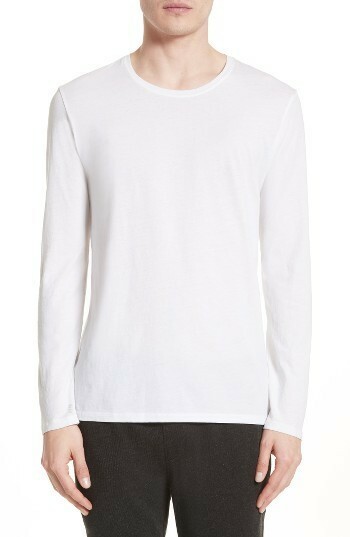 This pairing of an ATM Anthony Thomas Melillo cotton crewneck and navy skinny jeans combines comfort and functionality and allows you to keep it low-key yet contemporary. 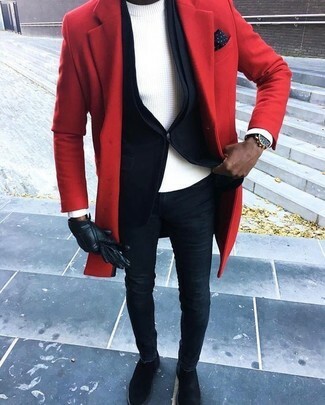 You could perhaps get a little creative in the footwear department and lift up your getup with black suede chelsea boots. 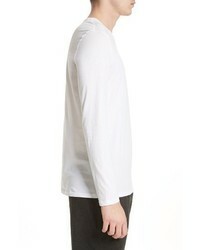 Consider teaming an ATM Anthony Thomas Melillo cotton crewneck with white dress pants to ooze class and sophistication. Opt for a pair of white leather low top sneakers to have some fun with things. 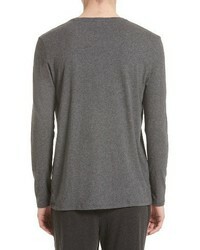 If you're searching for a casual yet on-trend getup, try pairing a white crew-neck sweater with olive corduroy jeans. Both pieces are totally comfortable and will look great together. When it comes to footwear, this ensemble is finished off wonderfully with white leather low top sneakers. 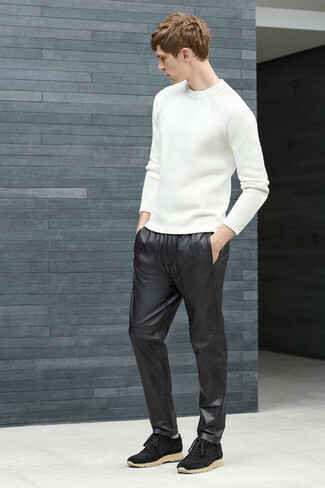 If you're after a casual yet seriously stylish outfit, consider pairing a white crew-neck sweater with charcoal chinos. Both items are totally comfortable and will look great paired together. Make your getup more fun by finishing off with white canvas low top sneakers. If you're looking for a casual yet on-trend getup, try pairing an ATM Anthony Thomas Melillo cotton crewneck from Nordstrom with navy chinos. Both pieces are totally comfortable and will look great together. Sporting a pair of dark brown suede oxford shoes is a simple way to add extra flair to your ensemble. If you're a fan of comfort dressing when it comes to your personal style, you'll love this easy pairing of an ATM Anthony Thomas Melillo cotton crewneck from Nordstrom and blue ripped skinny jeans. 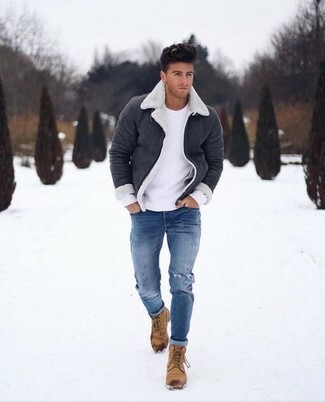 Sporting a pair of tan nubuck casual boots is a simple way to add some flair to your getup. 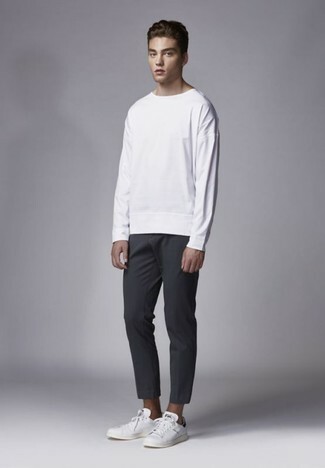 This pairing of an ATM Anthony Thomas Melillo cotton crewneck and black chinos combines comfort and functionality and allows you to keep it simple yet current. Why not add white leather low top sneakers to the equation for a more relaxed feel? If you're searching for a casual yet stylish outfit, opt for an ATM Anthony Thomas Melillo cotton crewneck and black leather sweatpants. Both items are totally comfortable and will look great together. When it comes to shoes, this getup pairs nicely with black suede low top sneakers.